On Thursday, Gallaudet University students continued protesting the school's next president with a sit-in at the Sixth Street entrance to the Northeast campus. Photo Credit: By Marvin Joseph -- The Washington Post Photo. Since the blog entry from a few days ago, "What People Protest..." is being read and commented upon by people in the deaf community, I probably should expand upon it, because the other entry can be seen as uncomplimentary. I think the position, that the President of Gallaudet is more than "merely" the president of a university, but one of the leading representatives of the deaf community--nationally certainly and perhaps internationally--is reasonable. As protesters blocked every entrance to Gallaudet University yesterday, the target of their anger -- Jane K. Fernandes, the newly named president -- said she has no intention of withdrawing and believes she is caught in the middle of a cultural debate over what it means to be "deaf enough." Born deaf, Fernandes grew up speaking rather than using sign language, went to mainstream public schools and did not learn to sign until she was 23. "All those things are markers that define what kind of deaf person I am," she said in a meeting yesterday with Washington Post editors and reporters. "We're in a little bit of an identity politics struggle on campus regarding who speaks for deaf people." Interestingly enough, I made some similar points about the director of WMATA, the Washington-area subway system, a few months ago, in this blog entry, "More on Metro and rethinking transit marketing." In part, the blog entry was about the difference in approach between Richard White, and Dan Tangherlini. One problem with WMATA, and these problems start at the top, is a tin ear in terms of listening and relating to the public. They need to rethink their public communications efforts, and develop different kinds of campaigns according to the type of public they are attempting to reach. Anyone who took expository writing in school remembers those lessons about "defining your audience." The one problem with those classes is we didn't learn about how to categorize audiences more generally. For nonprofit and government organizations, Lauffer's work is particularly useful in this regard. Richard White didn't have much of a public persona, although he dealt mostly with high-level businesspeople and other government public officials. Since elected officials comprise a majority of the WMATA Board, and they are responsible, nominally, to the public, even appointed officials in high-profile government agencies perhaps need to consider how "public communications" activities are an increasingly important part of their job... if they want to keep their job (on the other hand, look what happened to David Gunn of Amtrak...). At the same time, marketing isn't really about "selling" only what you want to sell. It is about responding to the market(s) and segments, leading market(s), and often balancing conflicting objectives (such as elected officials that want to keep taxes low, citizens who want more transit, and operations personnel who are looking for more financial support to maintain deteriorating infrastructure). Public transportation systems have to sell use as well as funding, since farebox revenue only covers a portion of current operations, and nothing towards expansion (and WMATA is the number one transit system in the U.S. in the percentage of farebox revenue collected). Funding has to be sold to non-users as well as users, and of course, to public officials. Although, it's a much different question, comparing the leader of even such a widely-used public agency as WMATA to the leader of a university. What students (and alumni and professors) at Gallaudet are saying is that their president is a leader of the deaf community more generally. 2. a key leader of the higher education community (there are 3,000 colleges and universities in the U.S.). The president of Harvard is a public figure of national import in a manner fundamentally different from the "average" college presidents, especially when considering the high profile of past Harvard University presidents such as Derek Bok or James Conant--the president of Harvard University has a role that outspans the confines of the university campus. Similarly, the president of MIT speaks on behalf of the science and engineering research community--and the alumni magazine Technology Review, is seen as a key opinion publication for technology, the same kind of role that the Harvard Business Review plays in shaping business management. Or how the president of the New York Public Library is seen as the leader of the public library community. Dr. Vartan Gregorian left his position as president of Brown University (!) to take this job/role. 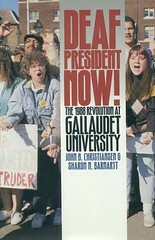 This book, about the original "Deaf President Now" movement, was published by the Gallaudet University Press. The Press plays an important role in the publication of books relevant to the deaf community. The National Association of the Deaf has sent a letter urging Gallaudet University's board of trustees to quickly resolve unrest over the appointment of a new president. Students have mounted protests since Monday, following the selection of Jane K. Fernandes, the university provost who grew up speaking rather than using sign language. Some faculty and staff have supported the students' actions, including a demand to reopen the selection process. "We stand with these concerned stakeholders, who sincerely believe that they are not being respected nor heard," wrote Andrew J. Lange, president of the National Association of the Deaf, in an open letter posted Wednesday. In an interview Friday with The Associated Press, Fernandes said some of the opposition to her selection may be due to disciplinary actions she's taken as provost. But she said others have questioned whether she is "deaf enough" to lead the school. "There's a kind of perfect deaf person," said Fernandes, who described that as someone who is born deaf to deaf parents, who learns ASL at home, attends deaf schools, marries a deaf person and has deaf children. "People like that will remain the core of the university," Fernandes said. But she added that 86 percent of the deaf and hearing impaired students in the United States now attend public schools because of improvements in technology, medicine and education. Once again, this seems to come down to issues over change and "contested spaces," in this instance about contested spaces within deaf culture. 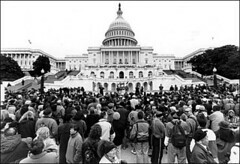 Deaf President Now march on the U.S. Capitol (Gallaudet), 1988. Given the fact that a significant portion of the Gallaudet University budget comes from the federal government, the U.S. Capitol is an apt backdrop for this protest. 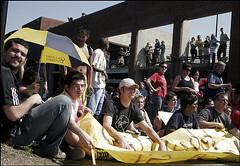 Image from Gallaudet University Press Relations website.